is correspondence makes it plain that Dickens struggled to produce the delightful prose farce "The Tuggses at Ramsgate"; to his fiancée Catherine he complained on 5 February 1836 of "The Tuggses at Ramsgate": "I wish to Heaven it would clear up. . . I never worked with so little pleasure" (I:125) — and yet with what apparent ease the amusing, almost theatrical satire on the nouveau riche rattles along with what one of the lesser characters describes as "ex-treme welocity" (341). Deborah A. Thomas in Dickens and the Short Story asserts that in this story (as in early pieces as varied in toneand subject matter as "The Black Veil," "The Drunkard's Death," and "The Great Winglebury Duel") "Dickens appears to be deliberately working with the subject of some kind of imaginative deviation from everyday thinking" (20). And as the three Ghosts of Christmas liberate Scrooge from his sober-sided, workaday self, so a windfall legacy operates on the Tuggses in general and on Simon (who awakes from a swoon as "Cymon") in particular, thrusting them from penny-pinching grocery-selling to a holiday romance in which their new-found wealth seems to make almost anything possible — even criminal conversation. Boz himself in closing the curtain on the piece classifies "The Tuggses at Ramsgate" as a short story: "A troublesome form, and an arbitrary custom. . . prescribe that a story should have a conclusion, in addition to a commencement; we have therefore no alternative" (354). On the other hand, T. W. Hill classifies it as a "Sketch" in his notes in Dickensian 47, and in its emphasis on outward forms, on the conduct of characters rather than their inner life, it fits that category. Part of the difficulty that Dickens experienced in writing "The Tuggses at Ramsgate" may stem from its dual nature. As Chris Baldick notes, "As a kind of prose narrative, a sketch is more modest than a short story, showing less development in plot or characterization" (206). To add to this confusion of genres, G. R. Thompson refers to the "half-way" status of the sketch in the early nineteenth century: "the sketch occupies a space between the essay and the tale, sharing features of both" (170). Certainly, despite the one-dimensional nature of the characters, the story's narrator proceeds with a constant eye to the single, preconceived effect and "the pre-established design" of which Poe spoke in his review of Hawthorne's Twice-Told Tales in 1842. In "The Tuggses at Ramsgate" there is considerably more emphasis on plot and more attention to details that contribute to plot (such as Slaughter's sabre) than one would expect in a sketch. And, although the narrator of "The Tuggses at Ramsgate" appears to have the cool detachment of a Hawthorne narrator, given the similarities between author and protagonist in this story, this exterior aloofness is something of a sham because Boz at some level must have seen himself as Cymon. In the terminology of the ephemeral publications of the 1830s and 1840s which are the literary context of "The Tuggses at Ramsgate," this piece, like The Pickwick Papers (1836-7), A Christmas Carol (1843), and The Chimes (1844), should be classified as belonging to "the literature of comic discomfort. "1 Viewed as a cautionary tale, "The Tuggses at Ramsgate" has its origins in such stage comedies as Shakespeare's The Merry Wives of Windsor and Goldsmith's She Stoops to Conquer in which the audience takes delight in the misperceptions, confusions, and foolish conduct of the male lover. Browning contends that Dickens' general target in Sketches by Boz is English class-consciousness or "a civility based on the pursuit of wealth and status, and riddled with snobberies and fetishes" (29). In these observations of the contemporary scene, as in Sheridan's The School for Scandal in the previous century, audience laughter functions as a self-corrective, purging the tendency to become, as Sir Philip Sidney remarked in A Defence of Poesie (1595), "such an one." Dickens' first article in the first number of The Library of Fiction, "The Tuggses at Ramsgate" was published on the selfsame day as the first number of the Pickwick Papers: 31 March 1836. Like Pickwick, the story is set partly in and partly outside London, and involves common London types: the fatuous nouveau riche Tuggses, the mercenary Waterses, and various impertinent and whimsical carriage drivers and land. 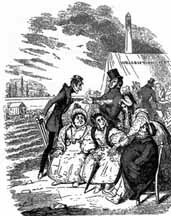 Hill notes that Belinda Waters' petitioning her husband to be calm when the reader and the Tuggses first meet the couple on the Ramsgate steamer renders the belligerent captain yet another stock Dickensian type: the irascible army officer who appears as Mr. Dowler in Chapters 35 through 39 in the Pickwick Papers. In time, he will develop into Bentley Drummle in Great Expectations as the brutish rival to the protagonist in terms of romantic interest. However, Captain Walter Waters' irascibility is no whimsical character trait but part of a deliberate and (as Cruikshank's accompanying plate suggests) convincing pose that is the key to the design or plot that the couple have formed to bilk the social-climbers and to which the name of the Waterses' companion, Lieutenant Slaughter, draws the reader's attention. A clue to the personal and class significance of the story for young Dickens is given in Peter Ackroyd's biography of Dickens. In short, Dickens as a rapidly rising star yearning for respectability and marriage must have seen something of himself and much of his age in Cymon Tuggs, a poetic posturer for whom sudden wealth means both the realization of lower-middle-class dreams and the concomitant loss of lower-middle-class identity. The text itself offers a pattern that suggests the kind of "future-shock" that the rapidly rising lower-middle-class was experiencing in the 1830s — the repeated references to fashion, food, the theatre, and travel. The staid, tawdry world of the Tuggses' chandlery (their name itself suggests "tug-meat" or bad mutton, according to Partridge) is fractured by the hasty entry of a stranger who brings news "From the Temple" (336), the lawcourts that are the temple of Mammon in nineteenth-century Britain. The mysterious minion of the law, like the attorney Jaggers acting on behalf of Magwitch in Great Expectations, in announcing a windfall metaphorically waves a magic wand that transforms the tale's protagonist from 'Cinderfella' to a gaudily bedecked, bubble-headed prince. That the place name so resonant with associations to Dickens' later fiction, "The Temple," is repeated four times gives the stranger's message not merely the qualities of wonder and dread, but also of incantation, as the full significance of his annunciation sinks into the Tuggses' consciousness. "Look up, my son," exclaimed Mr. Tuggs. Certainly the passage is redolent with images of baptism and confirmation, as if Dickens here is parodying Christ's adult baptism by John in the Gospels. Soon Cymon will have waters aplenty; going to take the waters, he will be taken by them. Click upon image for additional information and for a larger picture, which takes longer to download. With his author, Cymon shares not only "a great mind and romantic disposition" (335), but also a feeling of what Patricia Ingham terms "the magnetic attraction and power attaching to 'passionate' experienced women" (111). Coupled with the destruction of character and work ethic by unmerited wealth in "The Tuggses at Ramsgate," then, we have in Belinda Waters a force that both generates the plot and threatens "the whole fabric of bourgeois society by confusing and adulterating social identities" (Ingham 112), water being coincidentally one of the necessary constituents of steam power. The Waterses are, metaphorically, "fishers of men" since they utilize the laws against criminal conversation to blackmail the gullible. Belinda (associated with the French "belle" and the Spanish "linda" or "beautiful," although that element appropriately enough meant "serpent" in the original Germanic name6) has the seductive allure of a mermaid, who according to legend will destroy and consume the unwary sailor whom she has captivated. With such an aqueous element (as with Cymon's new-found social milieu) there is no sure footing. Stepping away from terra firma at the beach, the liminal area between land and sea, Cymon finds that his chair is sinking in the sand — foreshadowing his own deflation at the story's close. Two versions of The Tuggs's at Ramsgate by Robert Seymour (left) and George Cruikshank (right). Click upon images for additional information and for larger pictures, which take longer to download. A glow of nervous excitement passed over the countenance of Mr. Cymon Tuggs, as he replied, "An angel of beauty!" "Hallo!" said Mr. Joseph Tuggs. "Hallo, Cymon, my boy, take care. Married lady, you know;" and he winked one of his twinkling eyes knowingly. Throwing herself in Cymon's way at every opportunity, Belinda Waters manoeuvers the callow youth into a compromising situation, building romantic castles in the youth's mind: "If I had not been" — continued Mrs. Captain Waters — "if, in earlier life, it had been my fate to have known, and been beloved by, a noble youth — a kindred soul --a congenial spirit — one capable of feeling and appreciating the sentiments which" (348). As when he had received news of the family's good fortune at the opening of the story, Cymon indulges in a Keatsian 'waking dream' (also anticipating Arnold's persona in "Dover Beach"): "The moon had climbed higher into the heavens, by two hours' journeying, since those figures first sat down — and yet they had not moved" (351). Instead of returning on the morrow as Belinda had suggested he would, Captain Waters arrives at their rooms after his wife has lured the young man inside. Farcically, the smoke of the men's cigars (so evident in Cruikshank's plate) springs the trap by discovering the allergic Cymon. 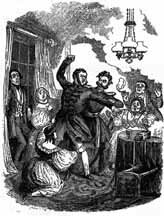 At the relatively modest cost of fifteen hundred pounds, the deluded youth like the feverish Pip at the close of Great Expectations recovers from his "nervous disorder" (354) and awakes from his delusion to confront the havoc that his social posturing has caused his family. However, for the nervous young man about to become universally lauded as the author of Pickwick there is neither sentiment, nor romance, nor yet a rediscovered identity for his alter-ego in "The Tuggses at Ramsgate"; rather, there is the terrible feeling of having been caught out and made to look the fool. Instead of awakening from a dream and achieving an epiphany, as is Pip's experience, Cymon is made a laughing-stock and derided by public opinion as an "easy dupe." In abandoning the old life of the shop for unfamiliar geographical and social spheres, the Tuggses, urged on by the social-climbing and respectability-seeking Cymon, expose themselves to a world where they will be tested by experience and found wanting. The story's complication connects travel away from trade and the workaday world with the figure of the temptress, the seductive Belinda Waters, whose surname subtly signifies her association with travel and the drowning of the old self. Although infatuation civilises Cymon in Dryden's fable, in the person of Belinda Waters it humbles and chastens the self-obsessed lover, who perhaps fancied himself taking the lady who is another's by force of arms, as does his namesake in Dryden's Fables. Dickens employs the limited-omniscient narrative point of view to focus our attention on the feelings of the protagonist and yet distance us from him since he never proves himself worthy to be the self-analytical narrators that David Copperfield and Philip Pirrip grow up to become. The avuncular, Fieldingesque, satirical tone suggests a wealth of experience and concomitant cynicism far beyond Dickens' twenty-one years: like the "young ones making objects of themselves" (341) on the beach, stepping out in a new social milieu proves not without its dangers for the recently-renamed Cymon (Dickens had re-christened himself "Boz" in August, 1834), now entered at the bar and dressed in the height of fashion — note the "gilt waistcoat" (349) that Cymon wears at the evening reception in the town library (such dandyism in the matter of waistcoats The having also been a failing of the young Dickens noted as late as his first American tour). Although 'Simple' Simon Tuggs transforms his initials into a refraction of Dickens', he does not anticipate David Copperfield, for he is not a protagonist in the conventional sense of the fictional character with whom the reader identifies; rather, as a result of distancing authorial remarks on his peculiarities of behaviour and appearance, Cymon is more clown than male ingenue. The focal point of the reader's sympathies by default becomes Cymon's facetious foil, Boz himself, with whose estimates and bon mots the reader consistently is made to concur. The linguistic humour in which Dickens' ridiculing narrator indulges is a species of pun throughout, for the narrator is constantly associating two objects with similar names — for example, "Large fly" (carriage) and "reg'lar bluebottle" (341) in the cry of a driver at the pier. The elevated diction is humorously ironic, given the trivial nature of the story's action; for example, in imitation of juvenile romances, as the Waterses leave the Tuggses at the wharf, "Mr. Cymon Tuggs was alone in a heartless world" (341). Despite the presence of his family, Cymon, smitten by the roguish black eyes and puce coloured boots of Mrs. Waters, is ridiculous precisely because he emulates the unrealistic diction and preposterous behavior of contemporary drama — indeed, his very thoughts read for us by the narrator here reveal that Cymon, having given up his trade identity, has assumed a stage role, that of the sentimental lover. "What's the terms?" said Mrs. Tuggs, in a louder key. In this case, the "indisputable" (343) authority is merely the proprietor of a seaside lodging-house, but the contempt behind the narrator's definition of "attendance" is unmistakable, a derisive treatment of a petty authority and a tone born of those few years when the uncaring world consigned young Charles Dickens' beloved books to the pawnbroker and his wretched self to Warren's Blacking. "Capital srimps!" said Mr. Joseph Tuggs. "Well, then, shrimps," said Mr. Joseph Tuggs. "Srimps or shrimps, don't much matter." There was pity, blended with malignity, in Mr. Cymon's eye, as he replied, "Don't matter, father! What would Captain Waters say, if he heard such vulgarity?" "Or what would dear Mrs. Captain Waters say," added Charlotta, if she saw mother — ma, I mean — eating them whole, heads and all!" The reader, having deduced the true intentions and characters of the Waterses, recognizes all present for what they are: common dupes and common confidence men. Indeed, the whole scenario — the simple-minded, newly rich attracting the attention of the unscrupulous — is unfortunately all too common in upwardly mobile nineteenth-century Britain. The Waterses emerge as social privateers who prey upon the unwary who are in need of correction. As parasites upon the collective body of the nouveau riche they feed upon those who, embroiled in folly, wish to salvage their reputations in exchange for some of their newly-acquired property. In that they serve to render the pretentious Cymon a laughing-stock, the Waterses serve much the same function as Trabb's boy in s, deflating the ego of a social-climber and holding up the deviant petite bourgeois to the ridicule of his fellows. The "Platonic" scene between Cymon and Belinda underscores the fact that his is not a sexual obsession; rather, he is smitten with the notion of romance itself, which, like the younger Romantic poets vis à vis 'nature', he finds "soul-inspiring." Ultimately, then, Belinda is neither a femme fatale nor a seductress because no physical seduction is necessary in order to entrap her subject. The obsessed Cymon, prepared to risk himself for his conception of the beloved, undergoes various iterations in Dickens' later works, including such Dickens alter egos as the tree-climbing youth in "The Bride's Chamber" (October, 1857), the pathetic Richard Wardour in The Frozen Deep (1857), the anguished Sydney Carton in A Tale of Two Cities (1859) and the self-deluded Pip in Great Expectations (1861). Again to quote Bloom, "Here, as at so many points in his fiction, Dickens's imagery is uncannily profound, accurate, suggestive" (319), for what could be more appropriate than that the vendor of "cheese by the slice" (335), when he learns of that fortune which will completely disrupt his comfortable chandler's existence, should turn as white as his merchandise? Part of the felicitousness of the simile is that it reduces a human by equating him with an item commonly associated with him. While the Tuggses' egos may become inflated as a consequence of their realising their great expectations, the image suggests that deflation must necessarily follow their entry into a social sphere that is as strange to them as that beyond the rabbit's hole is for Lewis Carroll's Alice. Unfortunately, the Tuggses collectively and individually are as incapable of acquiring self-knowledge as is a cheese. Thus, the simile alerts us to the "false-witted" nature of the Tuggses, for whom emotional and intellectual (to say nothing of aesthetic and spiritual) growth will remain impossibilities. They are Jonsonian comic types operating on the sole principle that, as money has brought a change in outward circumstances, so it can bring about a parallel change in their identities. Their creator is well aware throughout that moving from a lower to a higher social stratum is not so easily effected as a steam journey to a seaside resort. At the conclusion of "The Public Life of Mr. Tulrumble, Once Mayor of Mudfog" (Bentley's Miscellany, January, 1837), after a series of misadventures consequent upon the protagonist's vain attempts to ape his political counterpart in London, the mayor of the sleep Thames village, Nicholas Tulrumble (a coal merchant grown rich through trade, rather than as, in the Tuggses' case, through chance) returns to his proper social sphere, the Lighterman's Arms. "I've come down to say that I'm very sorry for having made a fool of myself, and that I hope you'll give me up, the old chair, again" (44), he announces to his former cronies. Thus, like Ebenezer Scrooge in A Christmas Carol and Trotty Veck in The Chimes, the deviant confesses her error and is reintegrated within his proper social station. To complete the festivities, as in The Chimes, there is a country dance to signify the restoration of social harmony: "old Nicholas and Ned Twigger's wife led off a dance to the music of the fiddle and tambourine" (45). The community welcomes the return of the spiritual prodigal, who has been suitably chastened by his discomfiture. However, for Cymon and his family there is no return to the little corner on the Surrey side, because they have neither learned nor acted upon the moral lesson delivered by the Waterses. Cymon recovers from his tobacco nausea and "the nervous disorder into which misplaced affection, and exciting circumstances, had plunged him" (354). 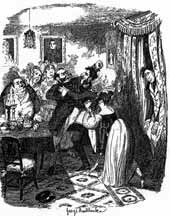 The Tuggses remain suspended in the reader's mind at that moment of humiliation in the Waterses' lodgings, the moment captured by both Seymour and Cruikshank, ridiculed as dupes alienated both by wealth and experience from the comfortable (if tawdry) lower-middle-class sphere from which they, Nicholas Tulrumble, and Charles Dickens hailed. Ackroyd, Peter. Dickens. London: Sinclair-Stevenson, 1990. Baldick, Chris. The Concise Oxford Dictionary of Literary Terms. Oxford: U. P., 1991. Bloom, Harold. The Western Canon. New York: Harcourt Brace, 1994. Boyle, Thomas. Black Swine in the Sewers of Hampstead: Beneath the Surface of Victorian Sensationalism. New York: Penguin, 1989. Browning, Robert. "Sketches by Boz." Dickens and the Twentieth Century. Ed. John Gross and Gabriel Pearson. Toronto: University of Toronto Press, 1962. Pp. 19- 34. Cresswell, Julia. The Tuttle Dictionary of First Names. Boston: Charles E. Tuttle, 1992. Dickens, Charles. "The Public Life of Mr. Tulrumble, Once Mayor of Mudfog." The Mudfog Papers. London: Richard Bentley and Son, 1880. Pp. 1-46. ---. "The Tuggses at Ramsgate." (1836). Sketches by Boz Illustrative of Every-Day Life and Every-Day People, il. George Cruikshank. The Oxford Illustrated Dickens. Oxford: Oxford University Press, rpt. 1987. Pp. 335-354. Dryden, John. "Cymon and Iphigenia, from Boccace." Fables Ancient and Modern; Translated into Verse from Homer, Ovid, Boccace, & Chaucer: With Original Poems. London: Jacob Tonson, 1700. Pp. 541-564. Easson, Angus. "Who is Boz? Dickens and his Sketches." Dickensian 81 (1985): 13-22. Davis, Earle. The Flint and the Flame: The Artistry of Charles Dickens. Columbia: University of Missouri Press, 1963. Hammerton, J. A. The Dickens Picture-Book: A Record of the Dickens Illustrators. London: Educational Book Co., n. d.
Hamilton, Ellis. British Railway History, 1830-1876. London: George Allen and Unwin, 1954. Ingham, Patricia. Dickens, Women, and Language. Toronto: Toronto U. P., 1992. Partridge, Eric. A Dictionary of Slang and Unconventional English. Ed. Paul Beale. 8th edn. New York: Macmillan, 1984. Thompson, G. R. "Literary Politics and the 'Legitimate Sphere': Poe, Hawthorne, and the 'Tale Proper'." Nineteenth-Century Fiction 49, 2 (September, 1994): 167-195.